The two symphonies in tonight’s concert were composed at very different times in Shostakovich’s life. The First Symphony was completed in July 1925, having been presented in an unfinished two-piano version before Glazunov two months earlier as Shostakovich’s graduation thesis at the Leningrad Conservatory. The work reflects the relative artistic freedom which prevailed in the Soviet Union in the 1920s and the influence of contemporary Western composers such as Hindemith and Krenek, as well as the Russian symphonic tradition of Borodin, Rimsky Korsakov and Tchaikovsky with which the young composer was also highly familiar. The Ninth Symphony, on the other hand, was composed in August 1945, shortly after the Soviet Union’s victory, at appalling cost, in the Great Patriotic War. Both the works we will hear tonight gained notoriety, but for different reasons. Following the first performance of the First Symphony in Leningrad on 12 May 1926, the work was performed not only throughout the Soviet Union, but also in the West – in Berlin (1927), Philadelphia (1928) and Vienna (1928) – and excited the approval not only, for example, of Alban Berg but also, as his recently published diaries indicate, the young Benjamin Britten, who listened to several performances on the radio in the early to mid-1930s and expressed wonder that such a work could have been written by a nineteen-year old. Indeed, for Britten, the work particularly embodied the high hopes he held for Soviet music. Interestingly enough, his interest in the work occurred nearly thirty years ahead of his own friendship with Shostakovich. The work has remained in the orchestral repertoire, and Shostakovich himself annually celebrated the anniversary of the Leningrad première as marking the beginning of his career as a professional composer. Its personal significance for the composer is also attested by the quotation from the work in the Eight String Quartet (1960). The Ninth Symphony, on the other hand, was to provide further evidence of Shostakovich’s ‘formalism’ in the condemnations of 1948, which resulted in Shostakovich’s dismissal from his teaching positions and only gradual rehabilitation thereafter. It also remains not only the shortest of Shostakovich’s symphonies but, in many ways, one of the most elusive. Nevertheless, the First and Ninth Symphonies share several important features: an apparently unconventional structure; a significant use of solo instrumentation in contrast to the tuttis favoured by a nineteenth-century orchestral sound; an important role for percussion; and finally, and perhaps most importantly as a defining characteristic of Shostakovich’s musical language, a juxtaposition of ironic and tragic elements. 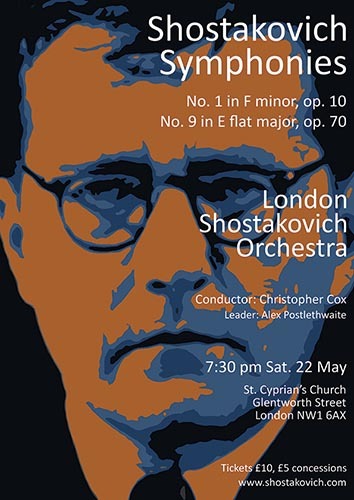 Shostakovich himself described his First Symphony as a ‘symphony-grotesque,’ and the juxtaposition of seemingly incongruous elements is particularly prominent in the first two movements. Commentators have also noted the almost cinematic presentation of ideas in contrast to the conventional sonata-form template of the nineteenth-century German (and Russian) symphony, a reflection, perhaps, of Shostakovich’s recent experience as a cinema pianist as well as his iconoclasm as a young composer. Thus, if three ideas dominate the first movement – a short grotesque introduction; an angular first-subject march; a second-subject waltz – each idea is stated in succession and subsequently elements of each are elaborated contrapuntally and collide, following which they are restated in reverse, suggesting a more circular structure and a thematic unity to the work as a whole, which becomes particularly evident in the final movement. The grotesque aspect is particularly apparent in the second-movement scherzo – a form for which Shostakovich had already shown a marked predilection – which shows Shostakovich making particular use of dynamic contrast and frequently varying the orchestral texture by means of string tremolo in different registers and alternating arco and pizzicato. As in the first movement, there are a variety of woodwind solos but the particular prominence of piano part in this (and the final) movement is striking; and the three fff repeated piano chords accompanied by string harmonics which conclude the movement are serious and enigmatic. The third movement is dominated by pathos and highly expressive in tone: a long oboe solo is taken up by cello and, in the central largo, juxtaposed with the rhythms of a funeral march. Again, the dynamic extremes in this movement are striking and, to an extent, the music may perhaps be seen as an early reflection of Shostakovich’s admiration for Mahler. A timpani solo crescendo leads attaca to the final movement, in which the influence of the modernism of the 1920s is perhaps most apparent, not least in the frequent changes of tempo. Shostakovich here seems to be superimposing upon the warm lyricism of Borodin and Rimsky Korsakov and a Tchaikovskian obsession with fate the angularity of contemporary rhythmic freedom. The work ends exuberantly, but if there is a triumph it is surely an ambiguous one. In writing a ninth symphony in the summer of 1945, Shostakovich was highly aware not only of the official desire (and considerable expectation in the West) for a victory symphony by its greatest living composer, but also the parallels which would inevitably be made with the model of Beethoven’s Ninth Symphony. Indeed, in 1944 the composer was considering a monumental completion to his trilogy of war symphonies (the Seventh and Eighth) and began (and subsequently discarded) a first version of his Ninth Symphony. The work which he did compose as his Ninth Symphony was entirely different. Later described by Yevgeni Mravinsky, who conducted the Leningrad première in December 1945, as ‘a work against middle-class conventionality…which scoffs at complacency [and] pompousness,’ it is scored for a large symphony orchestra yet frequently avoids monumental rhetoric by means of solo episodes and chamber-like textures; and the five-movement structure seems to emphasise the episodic character of the work. Neville Cardus, for example, described the work as ‘Probably the least symphonic music ever written’ and both the scherzando elements of irony and tragic lament are more refined, and set in sharper relief, than in the First Symphony.